A keloid scar forms when fibroblasts (a cell type involved in the healing of wounds) get confused and don’t know when to stop laying down collagen. They thus form, and continue to form, masses of scar tissue in a process known as keloiding. A keloid, by definition, travels outside the lines of the original scar. Keloids are benign tumors that most commonly affect people with darker complexions, such as individuals of African, Asian, and Polynesian descent. That’s not to say keloid scarring doesn’t occur in whites; it’s just less common. Keloid scars affect both sexes equally and are most prevalent in younger people below the age of about thirty. There are several ways to get rid of keloid scars, dependent on where they appear. 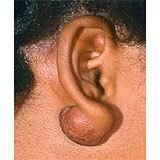 While a keloid is most likely to show up on places of the body like the ears, chest, shoulders, and neck, they’re really not all that picky and can show up virtually anywhere. Usually they rear their ugly heads at the sites of burns, scratches, lacerations, pimples, chicken pox, piercings, surgical scars, or basically any other type of wound you can imagine. They have even been reported to show up for no discernible reason at all. No matter where they show up, though, one thing is certain: you don’t want them there. Besides all of the obvious “medical” reasons for wanting to get rid of keloid scars (see left), they have a tendency to be quite large and obvious and so make people feel self-conscious. So, in this article I’m gonna go over some of the most common and effective keloid scar removal techniques as well as a few highly effective products for keloid scar treatment. Although hypertrophic scars are often mistaken for keloid scars (both can be red or pink, fleshy, and lumpy), the differences are quite substantial. 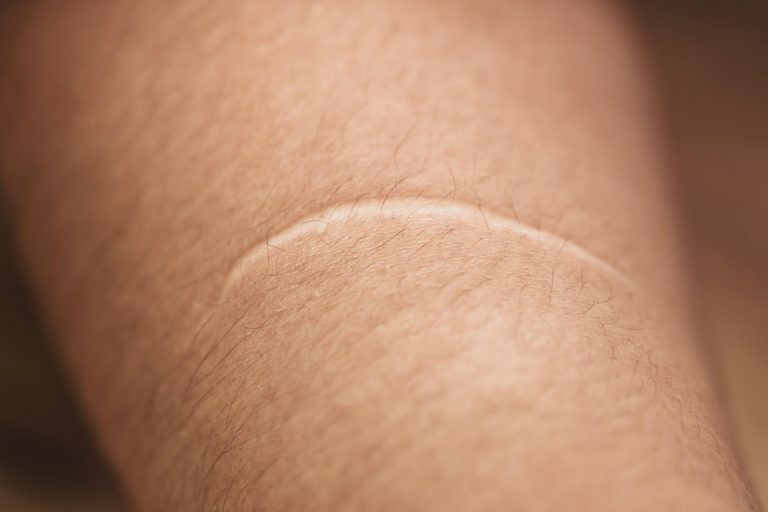 Hypertrophic scars are far more common and, while looking similar to a keloid, do not get nearly as large and don’t grow outside the lines of the original scar as a keloid does. Besides the fact that keloids can get quite large and bulbous, they also have a tendency to be tender, itchy, and sometimes cause intermittent sharp pains. This is probably the most common form of keloid treatment. Injections of intralesional corticosteroids (um, yeah . . . steroids) reduce scarring by slowing down collagen synthesis. TAC (triamcinolone acetonide) is the most commonly used of these. The shots are generally administered at intervals of about four to six weeks. While the results vary, there is a pretty good rate of success. Another common method of keloid scar removal is cryosurgery. Yes, Mr. Bigglesworth, cryosurgery. It’s really very similar to the method that’s employed when warts are frozen off. All that’s used is good old-fashioned liquid nitrogen. The only catch is that the treatment may need to be repeated every three to four weeks. Sometimes, for better results, cryosurgery will be coupled with steroid injections. This method for getting rid of a keloid scar is exactly what it sounds like: slice and dice. It’s kind of a scary option, but if the keloid scar or scars are large enough, it may be preferable. 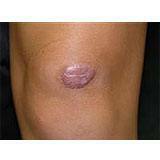 Excision alone is rarely successful at keeping keloid scars from reforming. However, if steroid injections or radiation therapy are used post-op, the results are far more promising. Talking to a medical professional will help you with this idea. 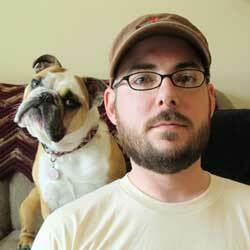 In the spirit of sticking with the Austin Powers motif, I feel I have to mention frickin’ laser beams. Laser scar removal is a popular method for taking care of an acne keloid. The two types of lasers generally used for acne scars are fractional CO2 lasers and Er:YAG lasers with the latter of the two being less invasive. They work by removing old tissue so that new, healthier tissue can grow back. Laser scar removal often requires repeated treatments. Radiation for keloid scar treatment. Due to the very small but very scary risk of trading a keloid scar for a nice little batch of cancer, this treatment is highly controversial. In radiotherapy, an electron beam is used to blast all the leftovers after a keloid is removed through excision. The use of post-op electron beam radiation helps to lessen the chances of keloid recurrence and could . . . very possibly . . . give you those superpowers you’ve been dreaming of. Perhaps the worst thing about the keloid scar treatment methods mentioned above (besides the invasiveness of the procedures) is the fact that it is quite possible that even after going through all the pain and hassle of getting rid of a keloid scar, it could come back. Possibly worse than before. If you’re working on getting rid of keloid scars that aren’t too bad, you may want to consider trying some silicon sheeting or a keloid scar healing gel. Silicon sheets are super easy to use and many people have had good luck with them. They are most effective for new scars but have shown to be effective on old scars as well. Silicon sheets basically go on like a Band-Aid. One side is adhesive, and the other side is not. The reasoning behind why these are effective is not well understood, but it is thought to be a combination of pressure, hydration, and the belief that the silicon stimulates the repairing of the top layer of scarred skin. Look for brands such as Mepiform (you can find this at Amazon) and Cica-Care. There are also silicon gels available that do pretty much the same thing but are not quite as effective, as they don’t apply the pressure that the silicon sheeting does. However, people often do use both on highly visual keloid scars, with the less visible gel being used when in public situations and the sheets being used in privacy. Look for brands like Contractubex and Xeragel. This method requires nothing more than your fingers and is most commonly recommended for an acne keloid or an ear keloid. Simply apply pressure to the keloid for three to five minutes at least three times a day. For an ear keloid, wearing clip on earrings will often be enough to make the keloid disappear. Keep in mind it can take several months before there is a noticeable difference. The number of uses for tea tree oil never ceases to amaze me. I’ve read lots of success stories from people who have used tea tree oil to get rid of an ear keloid. Simply apply some of the oil to a cotton ball and wipe your ear keloid with it. Do this once in the morning and once in the evening each day. Again, don’t expect immediate results. We recommend ArtNaturals Tea Tree Oil from Amazon. Although it is yet another one of the keloid treatments that has a tendency to take quite some time before a difference is noticed, many people have sworn by it. Differences are sometimes seen within several weeks, but it often takes months or, in some cases, up to a year before noticeable differences are seen. Apply to the keloid several times a day and stay diligent.